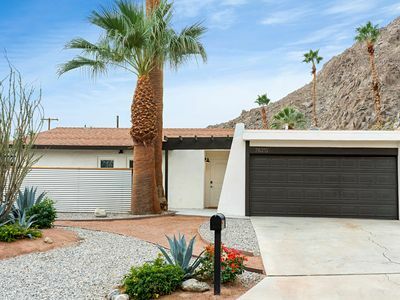 Enjoy a truly one of a kind La Quinta luxury experience in this NEWLY RENOVATED (Summer 2018) expansive 3-bedrooms (including private casita) 3.25 bath, 2,600+ square foot home on a quarter acre located on the preferred side of the world-famous PGA West Weiskopf course. 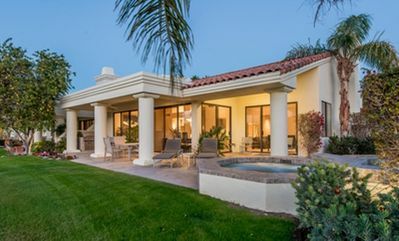 This professionally remodeled and elegantly furnished pool home features breathtaking sunset views, glorious afternoon pool-side sun, brand new 65’ Television, firepit, horseshoe pit, new 4 sectional with recliner and designer furniture throughout the home, new glassware, flatware, bedding, 800 + thread count linens, new “fluffy” towels, comfortable pillows, hotel bath amenities and more!!! On top of the ideal location with amazing views of the sunset over the mountains, this home can be rented with the house next door. 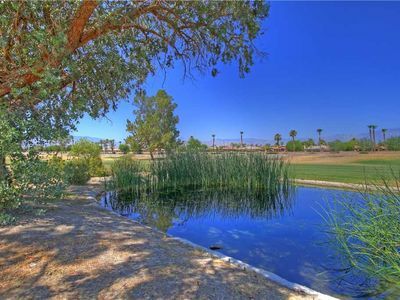 IF PLANNING A LARGE FAMILY GATHRERING OR GROUP VACATION, NO TWO FINER ADJOINING HOMES FOR LARGE GROUPS AND MULTIPLE FAMILIES CAN BE FOUND ANYWHERE IN PGA WEST. Please contact manager for availability. This is a brand-new renovation inside and out! 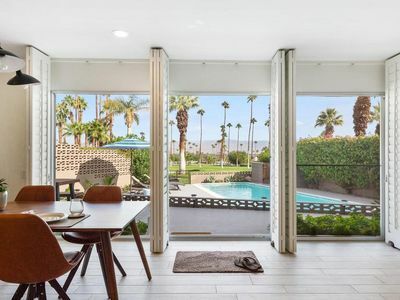 The home is tastefully decorated with fine accents and features designed to bring the guests into a vacation state of mind where lounging and leisure are encouraged. 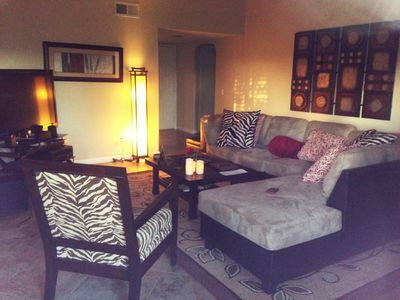 This desert oasis is designed to provide maximum relaxation and comfort to our guests. The backyard is ideally situated to provide afternoon sun and spectacular mountain and sunset views. 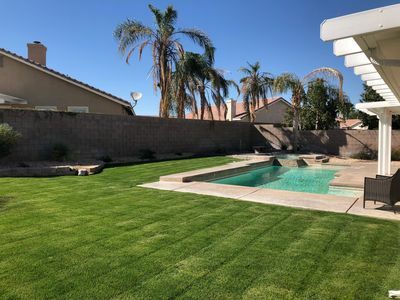 The spacious back yard spans the width of the property and allows generous space to relax in the cushioned lounge seating around the exceptional new fire pit for a one of a kind experiences! 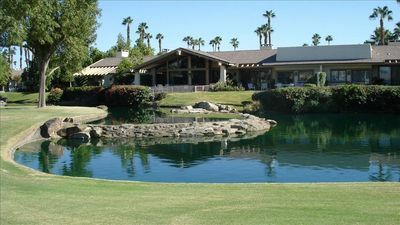 Of course, no vacation to PGA West is complete without some serious pool time. 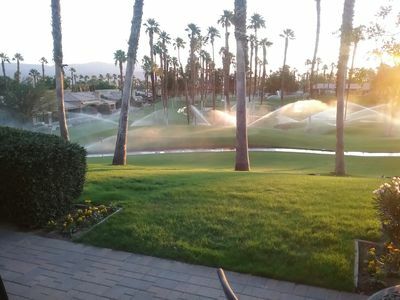 Here you will experience the pool and jacuzzi with seclusion provided by a lovely stone border, yet with magnificent views of the Santa Rosa mountains, golf course and sunsets. 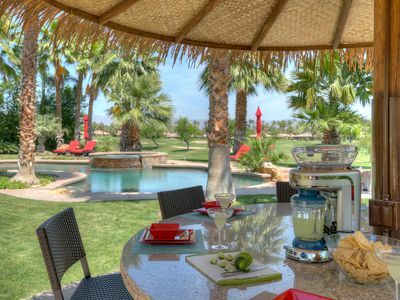 Whether you like full submersion, dipping your toes in the water or just sitting by under the palapa enjoying a beverage we are confident there are few better, if any, places to spend your pool time in the desert. Please also take advantage of the built-in outdoor bar b que and heat warmers at night. There are plenty of lounge chairs in which to comfortably take in the sunset around the pool. There are two tables with seating for ten under the balcony adjacent to the pool and golf course. 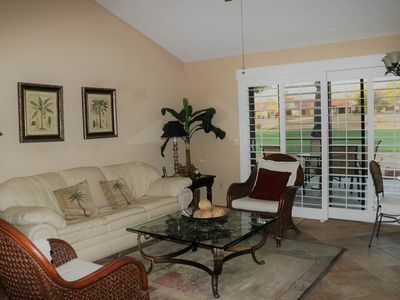 Entering the home from the front gate you will be greeted by a palm tree lined courtyard with patio set. Open the front door and to find a lovely rotunda under a welcoming contemporary chandelier. Forward is an expansive living room designed to provide a vacation “vibe” in a warm and open space. 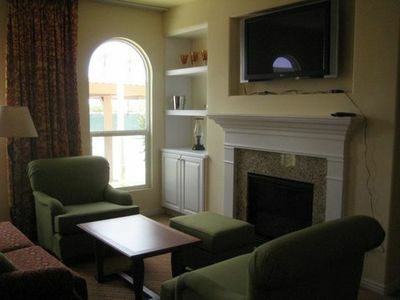 You will find comfortable couches and plenty of seating around the charming fire place. The design of the home is geared toward providing an open floor area so everyone can enjoy their time together. 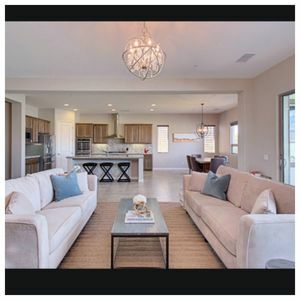 The dining area, bar and kitchen are all interconnected making this the perfect area to enjoy drinks and conversation while cooking in the kitchen surrounded by granite countertops, and stainless steel appliances. The kitchen is fully stocked with all of the supplies you will need including Keurig Coffee Maker with starter K-Cups, Tea Kettle, Blender, 4 Slice Toaster, Professional Grade Pots, Pans, Mixing Bowls, Cooking & Baking Sheets and hand mixer. The Master Bedroom Suite features a King bed with sliding glass door to access the back yard or simply pull back the drapes to take in the beautiful surroundings. Classic bedding including new 800 plus thread count sheets and comfortable pillows make sleeping under the ceiling fan a pleasure. There is plenty of closet and dresser space for all your belongings. The Master Bathroom is lushly carpeted with classic stand-alone jacuzzi tub, walk in shower, vanity table, his and hers sinks and, or course is equipped with plenty of new fluffy towels. The walk-in closet has more than enough room for two wardrobes. The Casita include a wet bar, coffee maker, television and Plantation Style Bedroom Suite including an Island Estate West Indies poster bed designed for maximum comfort and is outfitted with luxury bedding. With a desert breeze inspired lighted ceiling fan overhead, the entire room evokes a spa-type atmosphere. Matching nightstands and armoire provide ample storage. The bathroom is accessible from the bedroom suite and is fully stocked with hotel style accoutrements. 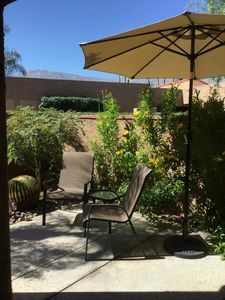 You can walk out of the Casita and enjoy your morning coffee in the courtyard. The Bunk Room includes bunk beds and a twin bed; a perfect room for family kids. While this room is great for Kids, it is also decorated in a cool breeze ambiance, so adults will be comfortable as well. This room also has a Lighted Ceiling Fan and plenty of room. The third bathroom includes a shower-bath, so you need not worry about lines to shower in the morning. The dedicated washroom is full-service with a washer, dryer and sink. Your experience is extremely important to us so we have included many upgrades and amenities that typical rentals do not. With a roll away bed and pull-out couch this home can easily accommodate 12 people. 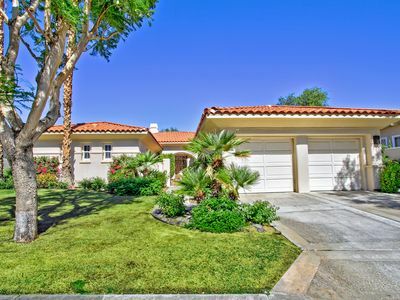 The home includes HVAC and the glass doors open to the golf course to allow the breeze to flow through the home There is storage room in the garage for golf clubs as well as cars. All the rooms are equipped with televisions and all the amenities you should need for a fantastic vacation, but if you find you need something else during your stay, please let Jenny know and she will do her best to accommodate. Thank you for considering this lovely home. 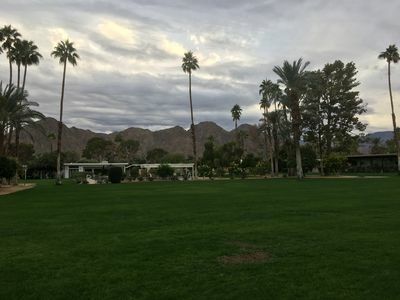 We hope you will stay with us, but regardless please enjoy your stay in La Quinta which we believe is a national treasure. 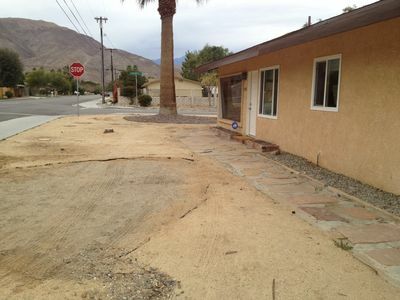 COACHELLA II available - private spa, A/C, cable & more! 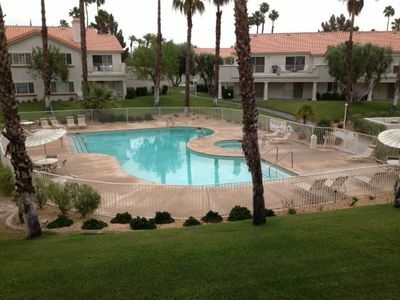 Platinum Palm Valley Condo 10% Discount offered for 1 Month Stay! The ideal music festival home! Minutes from the festival grounds! RV parking!